"Honestly, I'm still in the discovery phase of all that. I'm not sure I am an artist in the sense of someone who sees the world in a particular way. But I do have a pretty good idea of what I like and don't like, what I start to see when I have the camera around my neck." PD: You seem driven to capture the epic landscape and wildlife scenery of Colorado and by the looks of it, you've been quite successful. What gets you out there, what keeps you looking for more? Brian: Honestly I'd be out there even if I didn't have a camera. What led me to buy a real camera recently is I found myself in the last year very seriously taking shots with my 1.2 megapixel cellphone. I just love the big spaces, pure air, silence, great light. I'm one of those weirdos who's never completely happy inside. I feel like the great outdoors completes me in some way I can't articulate. And when I'm somewhere I've never seen before, its especially exciting. Colorado is one of those places on Earth where there are few ordinary scenes, every angle is a vista almost too large for the eye to see at once. As a photographer, how do you select your compositions from all the possibilities before you? "I feel compelled to seek out some kind of form that reflects wholeness, is how I'd put it. The frustrating thing about shooting landscapes is it's very difficult to not get chaotic compositions unless you're really concentrating. Nature simply doesn't organise itself in that way. So there's the contradiction - you feel like a million bucks, you feel whole, like you're surrounded by a total holiness but everywhere you look, you're picking through chaos. So I feel driven to find forms I guess, to bridge that gap." The intro shot Canyonlands NP (Island in the Sky) may be a good reference here. It's beautifully composed and dramatically lit. Tell us about the effort on that day. "Well, I probably took about 3 minutes after coming upon that incredible fog-filled overlook. So one is still in a state of awe of sorts, so I'm not sure how left-brained and rational my effort was. The pictures I take that end up pleasing me usually originate in a kind of right-brained feeling, like an invisible rightness I feel when coming on a composition." 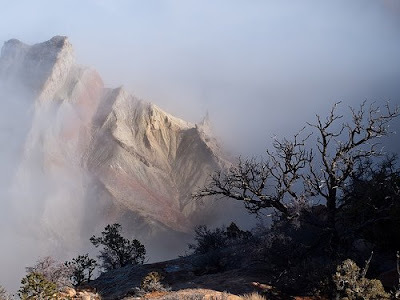 "I suppose on that one, it was just the simplicity of the form - the way the slope of the foreground and the slope of the mountain in the fog crossed each other. I can't take any credit for the great light of course. It's that great, high-desert morning light." 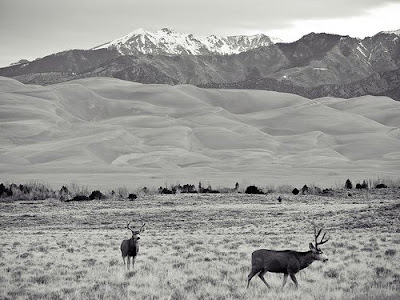 You've done two "Great Sand Dunes" studies, one featuring the geology itself and the other including some Buck Deer. Are you a naturalist at heart? "I suppose you could say that, though I'm afraid my scientific knowledge is pretty minimal. For me it's more intuitive than that. I just love being in those places that seem formed by something greater than rational. Also there's an uncanny aspect to encountering wildlife - they sense you, you sense them - you feel each other in some way. I've really enjoyed that." And what's next for you Brian, for your photography? "I know I'll continue to seek out these great places in the West and I've found adding an expressive dimension in photography really adds to the experience of being in those places, helps me see thing I wouldn't otherwise. Honestly, I don't know -- I'm a religious person, I believe in being blown by forces greater than oneself, so I'd certainly welcome being surprised. 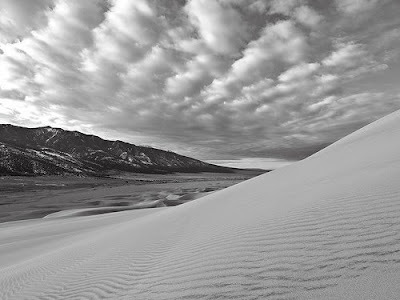 I think I'd like to continue to explore the great landscapes of the American West as long as I'm ambulatory."